Cities occupy only 0.5 per cent of the world's land but account for an estimated 70 per cent of economic activity, over 60 per cent of energy consumption, 70 per cent of global waste and 70 per cent of greenhouse gas emissions. 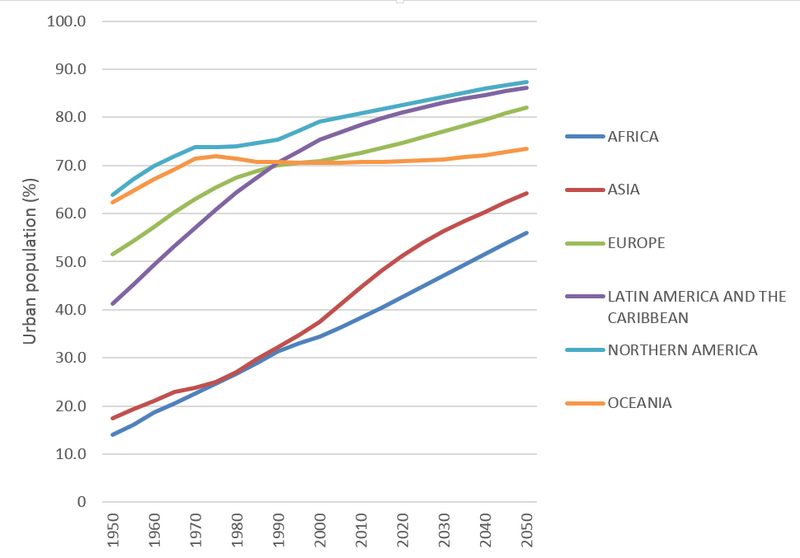 By 2050 they may account for 70 per cent of the world's population (the figure alongside gives the regional picture). The Habitat III conference in Quito in October will seek to set out a 'new urban agenda' for our increasingly urban world. Last week, IIED launched the excellent new issue of Environment & Urbanization (E&U), with articles covering many different elements of the agenda. Discussion at the event focused on what Habitat III might deliver. Habitat comes along just once every 20 years — IIED's David Satterthwaite, who spoke at the launch, was at Habitats I and II. Picking up on a common theme from the E&U articles, he observed that the impact of the first two conferences did not match expectations. So why might we hope Habitat III will have more influence? One possible reason is the timing. The new global goal framework of the Sustainable Development Goals (SDGs) and the breakthrough global legal treaty on combating climate change – the Paris Agreement – in 2015 have set the stage for a 'new urban agenda'. The implications of the statistics at the top of this blog are stark and simple. We will not achieve sustainable development without sustainable urbanisation. We will not achieve social inclusion without inclusive cities and towns. We will not achieve low-carbon, green economic transitions without low-carbon green urban development. David's comments also emphasised that achieving progress in addressing local level urban poverty and exclusion will require efforts to improve local governance, to link up institutions representing the urban poor with town and city authorities, and to deliver resources effectively to that local level. Gordon McGranahan noted that the language of Habitat returns incessantly to the theme of 'inclusion', but fails to consider the drivers of urban exclusion. Exclusion in cities can be seen as a testing ground for the SDGs. If cities continue to develop on exclusionary pathways – through markets and institutions that protect the spaces and living conditions of the wealthy – then we can be pretty sure that the SDGs' narrative of 'leave no one behind' is not working. Caroline Moser focused on the ways in which Habitat III's agenda might yield transformative change in gender power and in the situations of women and girls. She concluded that it is necessary to go beyond the language of rights and see concrete changes in the conditions under which women negotiate access and rights to assets on which they depend. Housing is an important example: this isn't just about a place for women and their children to stay, but also about safety, security of tenure and the potential to use that space to run businesses and earn money. The process which has led to the generation of the Habitat agenda is complicated and much of the agenda is already set out, as David Dodman outlined in his comments. The key question is whether the conference in October can still be used to focus attention and energy on changes which will produce better, more sustainable and more inclusive cities and towns. For me the discussion reinforced many of the themes of the recent 10th International Conference on Community-Based Adaptation held in Dhaka, Bangladesh on the theme of 'enhancing urban community resilience'. Dhaka itself gains 400,000 new residents each year. Some of this migration is attributable to climate change – certainly the impacts of sea level rise in the country's low-lying coastal areas are one of the forces driving the expansion in Dhaka's population. Many of the people arriving have little in the way of assets or rights to help them to navigate their arrival. The realities of poor urban communities are diverse – from the relatively formal and established situation of some to the highly fluid and informal position of others, such as many of the new arrivals in Dhaka. What can Habitat III deliver? The recently released Habitat III zero draft outcome document contains all the themes one would expect building on the 'post-2015' moment – with principles of 'leave no one behind', inclusive opportunity, and sustainability. But beyond the basic narrative, what practical changes might we hope to see from Habitat III? A focus on the urban challenge. Sustainable urbanisation is sustainable development – low-carbon economies can't be achieved without low carbon towns and cities. Development agencies have not yet been particularly effective at working on urbanisation so this is one area where Habitat III could focus minds. A focus on the vulnerable. If we see exclusive cities continuing to develop we will know the SDG agenda is failing. The future pathways of cities will be a litmus test for whether global development is truly inclusive. This includes recognising and addressing the basic needs of low-income urban residents, many of which are linked to city environments: clean water, adequate sanitation, improved air quality, and risk-reducing infrastructure. A positive agenda for healthier, more equal, greener cities. The climate change mitigation agenda dovetails with social progress in cities in unique ways. Low carbon urban spaces can generate many benefits with particular resonance for low-income groups, for women and for specific disadvantaged groups such as people with disabilities. Safe spaces, cities designed for ease of mobility for all users, effective and affordable public transport — these are all agendas which can produce healthier, happier, more equitable and greener cities. View the presentations of David Dodman on 'Preparing the new urban agenda' and David Satterthwaite on 'Can Habitat III produce a document that does influence government policies and practices?' on IIED's SlideShare site.